The AlarmCalm Button is a small, optional but important part of AlarmCalm. It's a fully intelligent loop device that allows building occupants to acknowledge a fire alarm signal locally, for example if they believe a smoke detector has signalled an alarm because of burnt toast or water vapour from a shower. The AlarmCalm Button then extends the verification time set in the Building Area by a specified amount, giving time for any transient signal to clear. On activation the Button starts a pre-programmed 2nd stage time. Failsafes are built in. It can only be pressed once for a particular event, all times are programmable as is the the number of devices in operation simultaneously before an automatic fire condition is latched. AlarmCalm Buttons are loop-powered and can be placed at any required address on the loop. This makes installation quick and easy with simple configuration of FAM occurring at commissioning. AlarmCalm buttons are attractive devices compatible with a UK single-gang back box. • Wiring terminations suitable for all Advanced recommended loop cables. 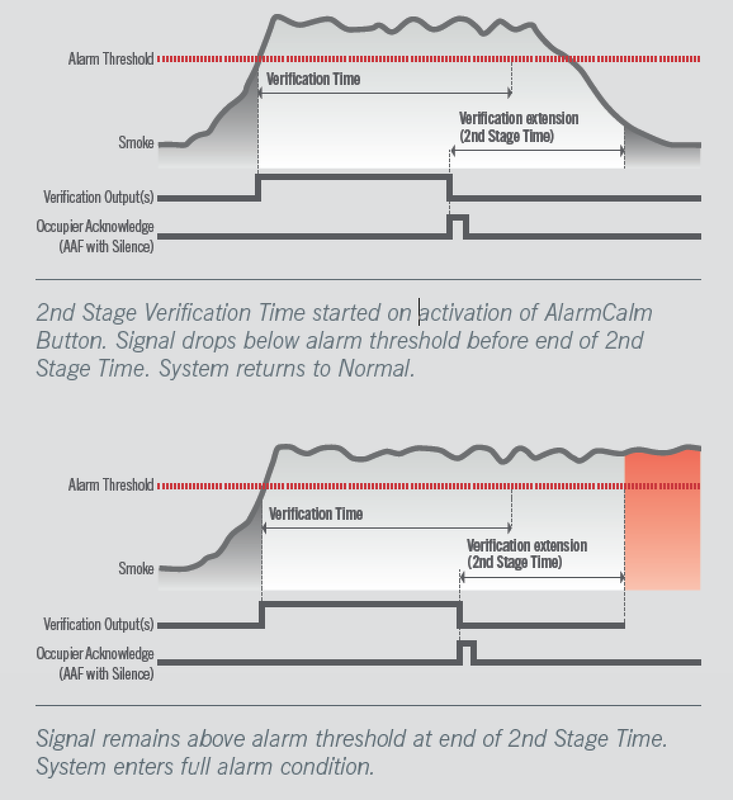 On activation by a resident or user of a building in a specific building area, the AlarmCalm Button initiates a second stage verification time, effectively extending the verification time to allow any unwanted signal to clear. If the signal clears before the end of the second stage verification time, the alarm returns to normal operation. If the device is still in alarm a full fire condition is signalled. 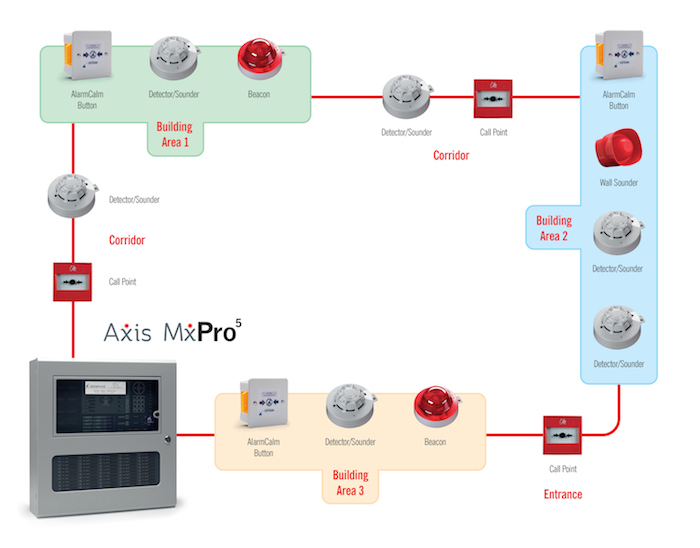 AlarmCalm's use of Building Areas make configuration and control of False Alarm Management both simple and powerful. Once an AlarmCalm Button has been wired onto a loop it's cause and effect can be quickly and easily configured in our Dynamix Tools software. Advanced's loop device approach makes for better system performance and flexibility, more cost effective and simple installation and faster commissioning.